After spending most of the weekend furiously cleaning and organizing for incoming family visitors, soft grungy layers were all my feeble mind could compute. Random food note: Mussel Bar’s Crawfish Pepperpot Soup makes for a pretty perfect Sunday mid-afternoon snack. You look way too cute for deep cleaning! I looooove the grungy vibe in this look! omg!!! i want that box purse!!! 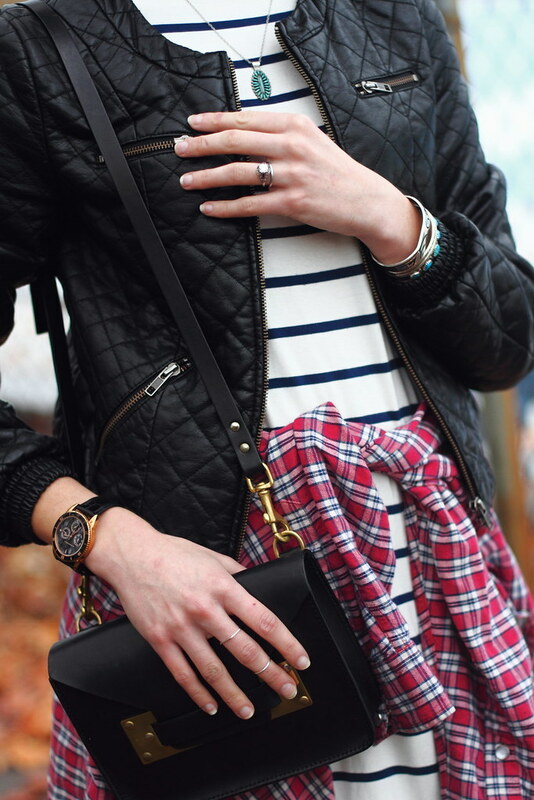 Gosh, I love the plaid and stripes together here, and your dark faced watch is too pretty. I also love seeing the leaves on the ground like that! So cute! I finally just finished cleaning my apartment for my parents arrival. Here is my guide to entertaining parents in DC for Thanksgiving.